The OpenLM Broker is an optional though highly recommended module that provides many benefits to the OpenLM system. It is normally located on the license server machine. OpenLM has been requested by its customers to provide a silent installation method for the OpenLM Broker, in order to support Broker version updates in a multiple-Broker environment. “Silent installation” is a form of software installation that does not display messages during its progress. This type of installation is specifically required for client applications such as the openLM Broker, which may need to be dispatched over a large number of license servers. The silent installation utility facilitates installation of the OpenLM Broker, without showing user interfaces and without requiring user interaction; meaning there is no “next→next→…→finish” procedure. 1. Download the latest OpenLM Broker version from the OpenLM site. 2. Open a command line prompt with administrative privileges. 4. 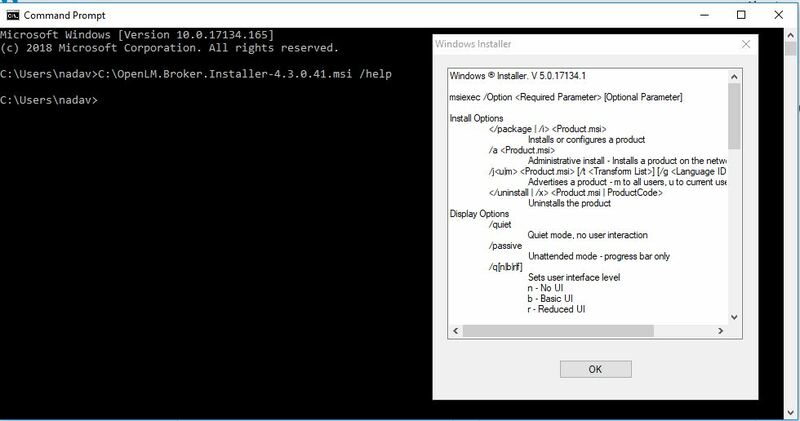 The Broker will be installed under the default installation folder (C:\Program Files (x86)\OpenLM\OpenLM Broker). If the folder does not exist, it will be created as part of the installation process. 5. The silent installer uses all default values when installing. 6. Older OpenLM Broker versions will be upgraded if they are found in the installation folder.